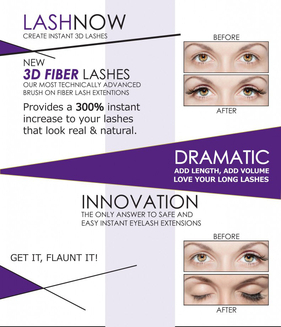 Have you always wanted long, voluminous and conditioned lashes? It’s here….straight from Milan!!! Lash Now is a two mascara system that includes: 1 Thickening Mascara Gel infused with beeswax to moisturize lashes and 1 Natural Lash Extender with green tea fibers. First, apply a generous amount of Thickening Mascara Gel from base to tip ensuring every lash has been coated thoroughly. Next, while the Mascara Gel is wet, apply generous coats of the Lash Extender fibers to your lashes the same in which you apply your mascara gel. Allow to set for 20 seconds. Finally, finish with a second application of the Thickening Mascara Gel to seal the Lash Extender fibers to your lashes. Repeat steps 2 and 3 until the desired length and thickness is obtained. Hypo-allergenic formula is safe for contact lens wearers and sensitive eyes.